A resource that moved from "marginal" to "spectacular" as a result of new drilling technology. Map of the Marcellus Shale thickness: Map showing the thickness of the Marcellus Shale formation in feet by the United States Energy Information Administration, using data from DrillingInfo Inc.; the New York Geological Survey; the Ohio Geological Survey; the Pennsylvania Bureau of Topographic & Geologic Survey; the West Virginia Geological & Economic Survey; and the United States Geological Survey. The gold dots on the map represent wells drilled between January 2003 and December 2014. Isopach lines represent formation thickness with a 50-foot contour interval. An additional 25-foot isopach is shown as a dotted line on the western edge of the map. View the full-size map. Super Giant Gas Field in the Appalachians? Twenty years ago, every geologist involved in Appalachian Basin oil and gas knew about the Devonian black shale called the Marcellus. Its black color made it easy to spot in the field, and its slightly radioactive signature made it a very easy pick on a geophysical well log. However, very few of these geologists were excited about the Marcellus Shale as a major source of natural gas. Wells drilled through it produced some gas but rarely in commercial amounts. Few if any in the natural gas industry suspected that the Marcellus might soon be a major contributor to the natural gas supply of the United States - large enough to be spoken of as a "super giant" gas field. As recently as 2002, the United States Geological Survey in its Assessment of Undiscovered Oil and Gas Resources of the Appalachian Basin Province, calculated that the Marcellus Shale contained an estimated undiscovered resource of about 1.9 trillion cubic feet of gas. That's a lot of gas, but spread over the enormous geographic extent of the Marcellus, it was not that much per acre. 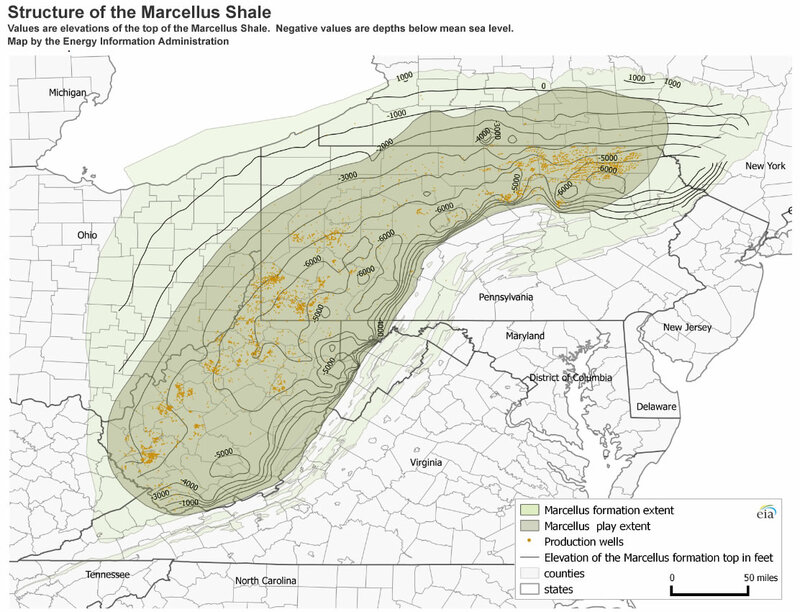 Map of the Marcellus Shale structure: This map shows the structure of the Marcellus Shale. The values on the map are elevations on the top of the Marcellus Shale in feet. Most of the values are negative, meaning that they represent "feet below sea level." This map was prepared by the Energy Information Administration using data from DrillingInfo Inc.; the New York Geological Survey; the Ohio Geological Survey; the Pennsylvania Bureau of Topographic & Geologic Survey; and the West Virginia Geological & Economic Survey. The gold dots on the map represent wells drilled between January 2003 and December 2014. View the full-size map. Range Resources - Appalachia, LLC may have started the Marcellus Shale gas play. 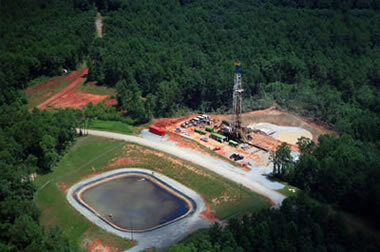 In 2003 they drilled a Marcellus well in Washington County, Pennsylvania and found a promising flow of natural gas . They experimented with horizontal drilling and hydraulic fracturing methods that worked in the Barnett Shale of Texas. Their first Marcellus gas production from the well began in 2005. Between then and the end of 2007, more than 375 gas wells with suspected Marcellus intent had been permitted in Pennsylvania . Marcellus Shale Stratigraphy: The stratigraphic nomenclature used for the rocks immediately above and below the Marcellus varies from one area to another. Information for Western Pennsylvania and Northwestern New York is shown above. Image by: Robert Milici and Christopher Swezey, 2006, Assessment of Appalachian Basin Oil and Gas Resources: Devonian Shale–Middle and Upper Paleozoic Total Petroleum System. Open-File Report Series 2006-1237. United States Geological Survey. View complete stratigraphy for other areas. How Much Gas is in the Marcellus Shale? In 2011 the Energy Information Administration reported that the Marcellus Shale contained approximately 410 trillion cubic feet of technically recoverable natural gas, but the following year the agency revised that number downwards to 141 trillion cubic feet. It is difficult to estimate the amount of gas in a rock unit that varies in thickness, composition and character, and is located thousands of feet below Earth's surface. Although the 141 trillion cubic feet estimate is only about six years' worth of natural gas consumption for the United States, companies have leased land, drilled wells, built pipelines, and made other investments that anticipate a much larger amount of gas in the Marcellus Shale . By early 2015, the Marcellus Shale was yielding about 14.4 billion cubic feet of natural gas per day. In addition, wells in the western part of the play, near the Pennsylvania-Ohio border and westward, were yielding valuable natural gas liquids and small amounts of oil. At that time the Marcellus was the source for over 36% of the shale gas produced in the United States and 18% of the total dry gas production of the United States. 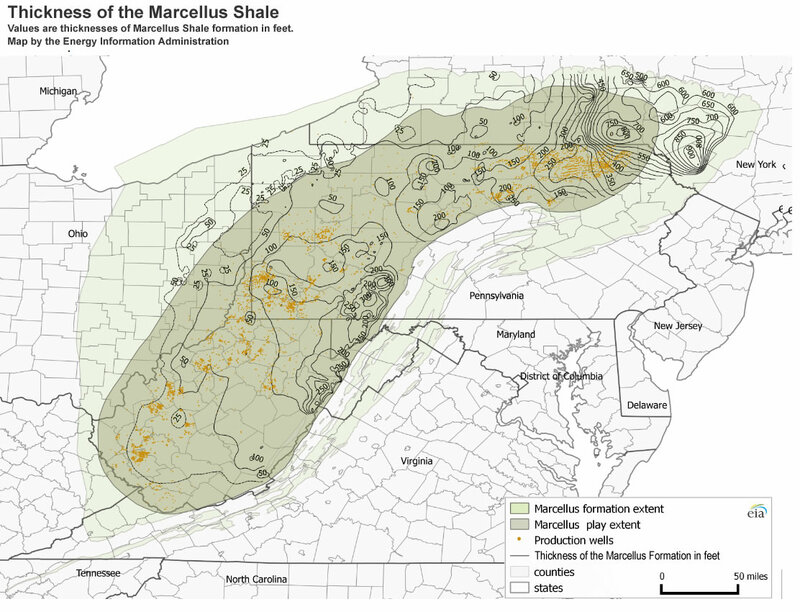 The Marcellus Shale, also referred to as the Marcellus Formation, is a Middle Devonian-age, black, low-density, carbonaceous (organic-rich) shale that occurs in the subsurface beneath much of Ohio, West Virginia, Pennsylvania and New York. Small areas of Maryland, Kentucky, Tennessee, and Virginia are also underlain by the Marcellus Shale. The maps on this page show the geographic extent of the Marcellus Shale. Cross-section showing the depth of the Utica and Marcellus shales: The cross-section above shows the subsurface position of the Marcellus Shale, Utica Shale and the continental basement rock. The line of cross-section is shown on the inset map. Note that the Utica Shale is about 2000 feet below the Marcellus under eastern Ohio but about 6000 feet below the Marcellus in south-central Pennsylvania. This map was compiled by Geology.com using data provided by the Energy Information Administration, the United States Geological Survey, the Pennsylvania Geological Survey, and the U.S. Department of Energy. How Deep is the Marcellus Shale? Throughout most of its extent, the Marcellus is nearly a mile or more below the surface. The Marcellus Shale structure map on this page shows the elevation of the top of the Marcellus Shale. These great depths make the Marcellus Formation a very expensive target. Successful wells must yield large volumes of gas to pay for the drilling costs that can easily exceed a million dollars for a traditional vertical well and several million dollars for a horizontal well with hydraulic fracturing. The generalized cross-section of the Utica and Marcellus Shales on this page shows how these rock units are very deep in southwestern Pennsylvania and then rise towards the surface into Ohio. This not only decreases the drilling depth to these rock units, but it also changes the amount of heat and pressure to which the rocks have been exposed. The Utica Shale in Ohio contains oil and natural gas because they have not been destroyed by heat and pressure. As the Utica descends into the subsurface towards Pennsylvania, the amount of heat and pressure to which it has been exposed increases and the oil has been destroyed, with natural gas remaining. With greater exposure to heat and pressure, the natural gas is destroyed. This is partially why some of the easternmost Marcellus Shale is unproductive. Thickness of organic-rich shale within the Marcellus in Pennsylvania: A map of Pennsylvania showing the net feet of organic-rich shale in the Marcellus Formation. John Harper of the Pennsylvania Geological Survey believes that the thickness of organic-rich shale may be more important than the total Marcellus thickness in assessing the production potential of a well site. Map after Piotrowski, R.G. and Harper, J.A., 1979. View the full-size map. Where is the Highest Production Potential? Rock units are not homogeneous. The gas in the Marcellus Shale is a result of its contained organic content. Logic therefore suggests that rocks that contain higher amounts of organic material have a greater ability to generate natural gas. A map showing the net feet of organic-rich shale in the Marcellus Formation can be viewed on this page. To date, areas in the northwestern part of Pennsylvania, where the Marcellus Shale has thick intervals of organic content, have been some of the most prolific producers of natural gas. United States Shale Gas Production by formation: This graph shows the time-trend of dry shale gas production for the major shale gas producing formations. It clearly shows that the Marcellus Shale formation got off to a relatively late start but quickly became the national production leader. Chart from the Energy Information Administration. Before 2000, many successful natural gas wells had been completed in the Marcellus. The yields of these wells were often unimpressive upon completion. However, many of these older wells in the Marcellus have a sustained production that decreases slowly over time. Many of them continued to produce gas for decades. A patient investor might make a profit from these low-yield wells with slowly declining production rates. For new wells drilled with the new horizontal drilling and hydraulic fracturing technologies, the initial production can be much higher than what was seen in the old wells. Early production rates from some of the new wells have been over one million cubic feet of natural gas per day. The technology is so new that long-term production data is not available. As with most gas wells, production rates will decline over time; however, a second hydraulic fracturing treatment could restimulate production. 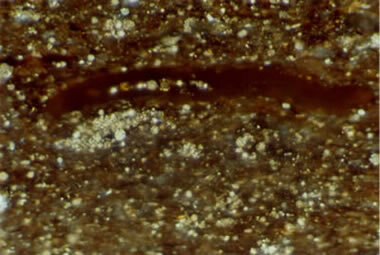 Photomicrograph of the Marcellus Shale: Photomicrograph of a polished section of Marcellus Shale in reflected light. The gold particles are pyrite grains which are common in organic-rich rocks. The large brown elongated body is a compressed plant spore with a few pyrite grains in the central cavity. The remainder of the rock is a clay matrix with a heavy brown organic stain. The width of this image spans about 0.2 millimeters of the shale. How Does the Gas Occur in the Rock? Natural gas occurs within the Marcellus Shale in three ways: 1) within the pore spaces of the shale; 2) within vertical fractures (joints) that break through the shale; and, 3) adsorbed on mineral grains and organic material. Most of the recoverable gas is contained in the pore spaces. However, the gas has difficulty escaping through the pore spaces because they are very tiny and poorly connected. Most historic wells in the Marcellus produced gas at a very slow rate because of the low permeability mentioned above. This is typical for a shale. However, some of the most successful historic wells in the Marcellus share a common characteristic: they intersect numerous fractures. These fractures allow the gas to flow through the rock unit and into the well bore. The fractures intersecting the well also intersect other fractures, and those fractures intersect still more fractures. Thus, an extensive fracture network allows one well to drain gas from a very large volume of shale. A single well can recover gas from many acres of surrounding land. Horizontal well: The most promising wells drilled into the Marcellus employ two technologies that are relatively new to Appalachian Basin gas shale production. One is horizontal drilling, in which a vertical well is deviated to horizontal so that it will penetrate a maximum number of vertical rock fractures and penetrate a maximum distance of gas-bearing rock. The second is "hydrofracing" (or hydraulic fracturing). With this technique, a portion of the well is sealed off and water is pumped in to produce a pressure that is high enough to fracture the surrounding rock. The result is a highly fractured reservoir penetrated by a long length of well bore. The fractures (also known as "joints") in the Marcellus Shale are vertical. So, a vertical borehole would be expected to intersect very few of them. However, a horizontal well, drilled perpendicular to the most common fracture orientation, should intersect a maximum number of fractures. 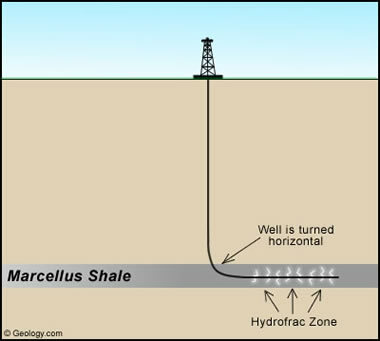 The accompanying diagram illustrates the concept of a horizontal well. High-yield wells in the Marcellus Shale have been built using the horizontal drilling technique. Some horizontal wells in the Marcellus Shale have initial flows which suggest that they are capable of yielding millions of cubic feet of gas per day, making them some of the most productive gas wells in the eastern United States. Although some experts are very optimistic on the long-term production rates of these wells, it is too early to determine their productive life or long-term yield. Shale fractures: Natural fractures or "joints" in Devonian-age shale. 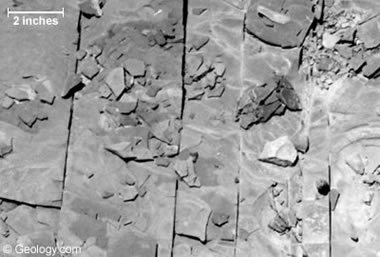 This is a highly fractured shale. A second method is used to increase the productivity of a well. That is to increase the number of fractures in a well using a technique known as "hydraulic fracturing" or "hydrofracing." This method uses high-pressure water or a gel to induce fractures in the rock surrounding the well bore. Hydrofracing is done by sealing off a portion of the well and injecting water or gel under very high pressure into the isolated portion of the hole. The high pressure fractures the rock and pushes the fractures open. To prevent the fractures from closing when the pressure is reduced, several tons of frac sand or other "proppant" is pumped down the well and into the pressurized portion of the hole. When the fracturing occurs, millions of sand grains are forced into the fractures. If enough sand grains are trapped in the fracture, it will be propped partially open when the pressure is reduced. This provides an improved permeability for the flow of gas to the well. The presence of an enormous volume of potentially recoverable gas in the eastern United States has a great economic significance. This will be some of the closest natural gas to the high-population areas of New Jersey, New York, and New England. This transportation advantage will give Marcellus gas a distinct advantage in the marketplace. Gas produced from the shallower, western portion of the Marcellus extent (see map above) might be transported to cities in the central part of the United States. It should have a positive impact on the stability of natural gas supply of the surrounding region for at least several years if the resource estimate quoted above proves accurate. Gas well site: Aerial photo of a gas well site. Image copyright iStockphoto / Edward Todd. Many landowners who own the mineral rights to their property are being approached with offers to lease their land. The size of the signing bonuses that have been paid in transactions between informed buyers and informed sellers is directly related to two factors: 1) the level of uncertainty in the mind of the buyer, and 2) the number of other buyers competing to make the purchase. These factors have changed significantly in a very short time. As recently as 2005, there was very little interest in leasing properties for Marcellus Shale gas production. The Marcellus was not considered to be an important gas resource, and a technology for tapping it had not been demonstrated. At that time the level of uncertainty in the minds of the buyers was very high, and the signing bonuses were a few dollars per acre. When the potential of the Marcellus was first suspected in 2006, a small number of speculators began leasing land - paying risky signing bonuses that were sometimes as high as $100 per acre. In late 2007 signing bonuses of a few hundred dollars per acre were common. Then, as the technology was demonstrated and publicized, signing bonuses began to rise rapidly. By early 2008 several wells with strong production rates were drilled, numerous investors began leasing, and the signing bonuses rose from a few hundred dollars per acre up to over $2000 per acre for the most desirable properties. If the results of current and future drilling activity do not match the expectations of companies paying for leases, the amounts that they are willing to pay could drop rapidly. Although signing bonuses generate an enormous amount of interest because they are guaranteed income, royalties can be significantly higher. A royalty is a share of a well's income. The customary royalty rate is 12.5 percent of the value of gas produced by a well. Higher royalty rates are sometimes paid by aggressive buyers for highly desirable properties. The royalties paid to eligible property owners from a well yielding over one million cubic feet of natural gas per day can be hundreds of thousands of dollars per year. Unfortunately, production levels in most wells fall rapidly, yielding much lower amounts year after year. If the Marcellus Shale holds up to the optimistic expectations of some natural gas experts, Pennsylvania, Ohio, New York, and West Virginia could temporarily have an enormous boost in income that might be sustained for a few decades. Number of Marcellus wells: This graph shows the number of unconventional wells drilled in Pennsylvania between 2007 and 2014. Between 2007 and 2011, unconventional wells were only targeting the Marcellus Shale. Starting in 2012, some wells began targeting the Utica Shale in western Pennsylvania. Drilling activity rose rapidly and peaked in 2011/2012 when the price of natural gas fell rapidly. Data in this chart was obtained from the Pennsylvania Department of Environmental Protection. Data from: Pennsylvania Department of Environmental Protection. Several companies are actively drilling or leasing Marcellus Shale properties. Range Resources, North Coast Energy, Chesapeake Energy, Chief Oil & Gas, East Resources, Fortuna Energy, Equitable Production Company, Cabot Oil & Gas Corporation, Southwestern Energy Production Company, and Atlas Energy Resources are some of the companies involved. The Pennsylvania Department of Environmental Protection reports that the number of drilled wells in the Marcellus Shale has been increasing rapidly. In 2007 only 27 Marcellus Shale wells were drilled in the state; however, in 2010 the number of wells drilled had risen to 1386. Many of these wells will yield millions of cubic feet of natural gas per day in their first year. However, the yield of individual wells usually falls rapidly over the next few years. The long-term yield of Marcellus Shale wells is uncertain. Some in the industry believe that they will produce lower but profitable quantities of gas for decades. It is also possible that many wells will be refractured in the future with improved technologies. The same drilling pad might be reused in the future to drill multiple horizontal wells in different directions. Marcellus Shale drilling pads have many future options. Marcellus Shale pipeline: At present, the natural gas pipeline capacity in the Marcellus Shale region is inadequate to carry the volume of gas that will be produced. Several major pipelines are needed to transport millions of cubic feet of gas per day to high-population markets. 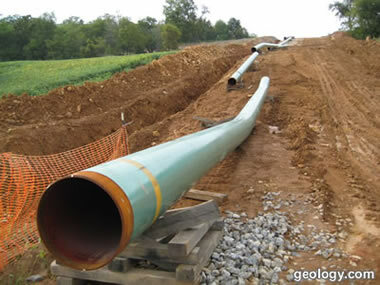 In addition, thousands of miles of natural gas gathering systems must be built to connect individual wells to the major pipelines. Hundreds of thousands of acres above the Marcellus Shale have been leased with the intent of drilling wells for natural gas. However, most of the leased properties are not adjacent to a natural gas pipeline. The total natural gas pipeline capacity currently available is a tiny fraction of what will be needed. Several new pipelines must be built to transport millions of cubic feet of natural gas per day to major markets. In addition, thousands of miles of natural gas gathering systems must be built to connect individual wells to the major pipelines. Many property owners will be asked to sign right-of-way agreements that will allow natural gas pipelines and gathering systems to be built across their land. If the property owner is not associated with the gas production, there could be compensation for granting the right-of-way. Payments could be as low as a few dollars per linear foot in rural areas to over $100 per foot in urban areas. Milici, Robert C., and others (2002). USGS Assessment of Undiscovered Oil and Gas Resources of the Appalachian Basin Province, 2002. Fact Sheet 009-03. United States Geological Survey. Harper, John A. (2008). The Marcellus Shale - An Old "New" Gas Reservoir in Pennsylvania. Pennsylvania Geology, Volume 38, Number 1. Pennsylvania Bureau of Topographic and Geologic Survey. Milici, Robert C.; Swezey, Christopher S. (2006). Assessment of Appalachian Basin Oil and Gas Resources: Devonian Shale-Middle and Upper Paleozoic Total Petroleum System. Open-File Report Series 2006-1237. United States Geological Survey. de Witt, Wallace, and others (1993), Principal Oil and Gas Plays in the Appalachian Basin (Province 131). U.S. Geological Survey Bulletin 1839-I, 37 pages. Engelder, Terry and Lash, Gary (2008). Unconventional Natural Gas Reservoir Could Boost U.S. Supply. Penn State Live. Piotrowski, R. G., and Harper, J. A., (1979). Black shale and sandstone facies of the Devonian "Catskill" clastic wedge in the subsurface of western Pennsylvania. Eastern Gas Shales Project, EGSP Series 13, 40 p. United States Department of Energy. United States Energy Information Administration (2012). Annual Energy Outlook 2012. An annual publication of the United States Department of Energy, DOE/EIA-0383(2012), 239 pages. Although the Marcellus Shale is the current unconventional shale drilling target in Pennsylvania, another rock unit with enormous potential is a few thousand feet below the Marcellus. The Utica Shale is thicker than the Marcellus, more geographically extensive and has already shown that it can be of commercial value. A generalized cross-section showing the relative positions of the Marcellus Shale and the Utica Shale is shown on this page. When the yield of Marcellus Shale wells starts to decline, new wells might be drilled down to the Utica to continue a stream of natural gas production. Drilling for the Utica will be more expensive because of the greater depth; however, the infrastructure of drill pads, right-of-ways, pipelines, permit data and other investments will reduce development costs for Utica Shale wells. The events described above are not unique to the northeastern United States or the Marcellus Shale. The horizontal drilling and hydrofracing technologies were perfected for shale reservoirs a few years ago in the Barnett Shale of Texas. The technology was then applied in other areas such as the Fayetteville Shale of northcentral Arkansas, the Haynesville Shale of northwestern Louisiana, and the Marcellus Shale in the Appalachians. These are just a few of several unconventional gas plays now happening in the United States and Canada. Similar organic shale deposits in other parts of the world might also produce gas as use of the new technologies spreads.